Let me introduce myself, I am Carl B. Erickson. I reside in Weld county Colorado. I am currently running for Weld county Commissioner at Large as a write- in candidate. Overall I am very pleased with your tenure as Governor, especially your handling of the recent tragedies in Aurora and the wildfire epidemic. But as a resident of Weld county, the county which has the largest number of oil and gas wells in it, I have one very large area of concern. I am heartily worried about the future of our great State, I fear the will and welfare of our citizens are being widely ignored. Widely voiced resistance to unwanted hydro-fracture drilling and the plethora of support industries involved in it are met by platitudes and rhetoric by our elected officials at the state and local levels. You, sir, are among the issuers of these. On July 17, 2012 you were quoted as saying “Like any industrial process, fracking has some risks but, really, if done properly, certainly out in the West, there is literally no risk — certainly much less than many industrial processes,” in an interview for Fortune Magazine. Which is it Governor? Some risk, literally no risk, or much less risk? Is it the ‘some risk’ of polluting reported by the Colorado Oil and Gas Conservation Commission estimated at 44% of spills at fracking pads resulting in contamination of groundwater? Or the ‘literally no risk’ imposed by drinking water contamination as reported by the Environmental Protection Agency in their draft report on contamination in Pavillion WY? Or the ‘much less risk’ posed by the EPA analysis of the lifecycle greenhouse gas emissions from natural gas being 9,000 times higher than previously reported? Or, maybe the operative phrase is, ‘if done properly’. Perhaps the necessary steps are not in place to insure the responsible drilling of which you speak. Perhaps the Colorado Oil and Gas Conservation Commission’s maximum fine of $1000 dollars a day per incident isn’t anything more than an acceptable operating cost to the offenders. Or maybe the handful of investigators we have is not enough. Whatever the cause, if we are not ensuring drilling is ‘done properly’ we are ignoring the health and welfare of our environment and our residents. Stunts like swilling fracking fluid as you said you did in a March 1 2012 radio report for KUNC, do little to assuage concerns when residents who live in the vicinity of frack sites can observe the effect of spilled fluids first-hand. Dying plants and dead water life are ample proof that just because you can drink a little something (grain alcohol for example), doesn’t mean it is healthy or conducive to growth when applied in gallons. Residents of Weld county find it a hard pill to swallow when ample water to raise crops and quench the thirst of livestock and yards is unavailable to them. Insult is added to this injury when rows of fracking water trucks line up 20 deep to fill up with water from municipal fire hydrants as they do in Greeley, and then transport that water on county roads so dry they spew dust high in the sky and depress the roadbed with their weight, right past farmers and ranchers whose crops and livestock could have been sustained for a while on the contents of those trucks. The contents of said trucks to be pumped into the impervious shale layer that will only return a small fraction of its contents to water cycle. I’m sure you have heard of these issues, as well as the issues of inappropriate use of roads and blatant disregard of traffic laws in Weld County and elsewhere in the state. Yes we have jobs, but at what cost? At what level of quality are we subsisting in this energy economy? Cash is one of those things that may be edible, but is not beneficial as a primary foodstuff. Human and environmental issues are not things we can plug in to a cost/benefit analysis; any loss in either of these areas negates any benefit that might be gained. If this industry cannot operate ‘properly’ it needs to be halted until such time as our lives and livelihood can be protected. Therefore, Governor, I implore you to reconsider your stance on the practice of hydro-fracturing, considering the welfare of the majority of the citizens of this state before the financial benefits of a minority interest. EXPLOSIVE OIL AND GAS LEAK OR CRUEL HOAX? What the frack is this?! "the time has come for our industry to acknowledge that a profound energy revolution is now necessary, to assure a healthy future for all of us". "Frankly, none of us can afford or accept the large scale catastrophes associated with climate collapse. Therefore, for those compelling reasons and because we have children too, we hereby pledge to an energy revolution, equivalent in scale to the challenges that face our generation. We pledge to transition from fossil fuels to alternative, sustainable energy source development, that also protects our most valuable natural resources: water, climate stability, Colorado's unparalleled natural environment, and the health of Coloradans." WOW!!! Then it goes on to "acknowledge the pioneering vision and practical roadmap of Colorado's Amory Lovins, and commit to implementing his program of 100% sustainable energy by 2050." WOW squared ! Concession to and agreement with the Man with a Plan ! Concluding with: "Over the next few months we will be releasing additional information regarding our transition steps, which will begin with asset relallocation. We look forward to announcing our progress and leading the way to a bright tomorrow." It seems way too good to be true. Where did this come from? Delivered by wild birds? Who would have done this? Someone's idea of a joke? What the frack? It's dated Aug. 16th. There is a session at Denver's Energy Epicenter Oil and Gas conference on the 16th with "Paradigm Shift" in the title, but the description hardly matches the above complete and total paradigm shift. Since this announcement document was found on the 14th but dated the 16th, is it a leak of an advance draft? Any of you attending the Paradigm Shift session on the 16th, please let the world know whether it supports or refutes the announcement content ! The theme of this year's conference is "Energy Revolution", but none of the descriptive material for the conference hints at a real energy revolution, rather, it all seems to be about ramping up fracking for oil and gas from our Colorado Niobrara shale. There is no such entity as the "Colorado Oil and Gas Industry Alliance" that would "proudly announce", only the Colorado Oil and Gas Association. So, what is this thing- a massive oil and gas leak or a cruel hoax ? Seems most likely that it's the latter, but it does provide fodder for thought. -Ask the press to check it out, and answer the question: Explosive Oil and Gas Leak or Cruel Hoax? -Ask a conference press representative to provide a response to the question: Explosive Oil and Gas Leak or Cruel Hoax? - Pass it around to friends and colleagues and ask them what they think about following through with the "Pledge to Colorado"
Let's get on this ASAP and start this conversation in Colorado around a "Colorado Pledge"! Heartbreakingly cruel hoax that this likely is, at the very least, it is a vision of the rationally operating world we are clamoring for and an opportunity for dialogue. One of Colorado’s richest environmental and wildlife gems, the Roan Plateau, has a new lease on life thanks to a federal court ruling Friday setting aside a BLM plan that would have allowed oil and gas companies to drill thousands of wells on 55,000 acres of the Roan. The ruling, by U.S. District Judge Marcia S. Krieger in Denver, sets aside a resource management plan approved in 2007 during the Bush administration that would have sacrificed for oil and gas development some of North America’s rarest plants, genetically pure cutthroat trout, tens of thousands of acres of wilderness-quality land, and crucial habitat for prize herds of elk and deer. BLM had acknowledged that drilling the Roan would cause permanent and irreversible losses to native trout populations and rare plant species, and also that wilderness-quality lands and opportunities for backcountry recreation would be permanently destroyed. Judge Krieger ruled that BLM’s plan should be set aside because the agency failed to consider a more balanced alternative that would have better protected the Roan’s wildlife, plants and pristine lands. In addition, the Court ruled, BLM failed to take a hard look at the air pollution that would result from drilling the Roan. Officials at the scene of an explosion at a methane compression station about five miles east of Elmore’s Corner on U.S. Highway 160. GEM VILLAGE – An explosion at a large gas compression station owned by BP killed one worker and seriously injured two others. The explosion, which occurred about 8:15 a.m. today at BP’s Piñon Compression Station, temporarily closed U.S. Highway 160 five miles east of Elmore’s Corner. “At this time our immediate concern is for the people involved,” said Julie Levy, a local spokeswoman for BP. The plant has been shutdown, and there is no remaining threat to workers or the public, she said. “The incident is essentially over,” Levy said. One contract worker died and two contract workers were injured, she said. Eleven workers were on site at the time of the explosion. “Everybody has been accounted for, and there is nothing ongoing about this incident,” she said. Residents in the area reported hearing the explosion. 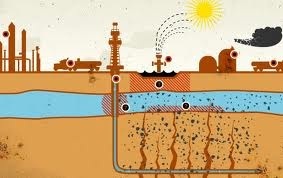 How can anyone say drilling sites are our neighbors? Dr. Geoffrey Thyne, -The University of Wyoming Professor was out of a job at the Colorado School of Mines after one of his study’s found fracking chemicals in a Colorado River. We will always honor your privacy so if you wish to remain anonymous, please indicate so. WTFrack.org does not engage in any illegal activities to acquire any of its information whatsoever. We operate in good faith and only use the open lines of public access that are offered to the general public. WTFrack.org's methods are exponentially effective and efficient in cataloguing, sorting and displaying data. We are investigators and obtain and display factually unaltered information that is open to the public from its source(s). No information was and will ever be obtained through any protected database or website. This information is available to the general public nation-wide. WTFrack.org logo may be used for non-sale related purposes only. Please cite WTFrack.org and send us a written intent of use. We are concerned citizens acting in good faith against the destruction of the environment, exploitation of OUR natural resources and the endangerment of public health. The system is not working. Our purpose is to be a resource for the public to make its own objective findings. We want clean air, clean water, clean energy. We want real laws that protect the people and the environment. We want accountability. We are representatives of Democracy. We are you. This site has no copyright on the published materials unless otherwise noted. All contents otherwise belong to the original publisher. Re-use only with their permission. WTFrack.org is not responsible for the expressed opinions of its users. Just like all of the oil companies. THIS SITE IS PROVIDED BY THE WTFRACK.ORG ON AN "AS IS" BASIS. THE WTFRACK.ORG MAKES NO REPRESENTATIONS OR WARRANTIES OF ANY KIND, EXPRESS OR IMPLIED, AS TO THE OPERATION OF THE SITE OR THE INFORMATION, CONTENT, MATERIALS, OR PRODUCTS INDLUCED ON THIS SITE. TO THE FULL EXTENT PERMISSIBLE BY APPLICABLE LAW, WTFRACK.ORG DISCLAIMS ALL WARRANTIES, EXPRESS OR IMPLIED, INCLUDING, BUT NOT LIMITED TO, IMPLIED WARRANTIES OF MERCHANTABILITY AND FITNESS FOR A PARTICULAR PURPOSE. WTFRACK.ORG WILL NOT BE LIABLE FOR ANY DAMAGES OF ANY KIND ARISING FROM THE USE OF, OR INABILITY TO USE, THIS SITE, INCLUDING, BUT NOT LIMITED TO DIRECT, INDIRECT, INCIDENTAL, PUNITIVE, AND CONSEQUENTIAL DAMAGES. You agree to indemnify WTFRACK.ORG and its officers, directors, volunteers, agents, distributors, and affiliates from and against any and all third party claims, demands, liabilities, costs, or expenses, including reasonable attorney's fees, that arise from your use or misuse of this site. WTFrack.org. Picture Window theme. Powered by Blogger.